Melt butter in large skillet over medium heat. Add chicken and cook for 5-6 mins on each side until an internal temperature of 165°F is reached. Add red pepper and mushrooms and cook for 5 minutes. Season with salt and pepper. 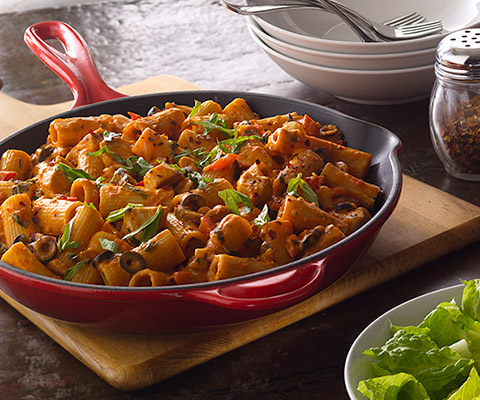 Slowly add Classico® Spicy Tomato & Parmesan Cream Sauce and let simmer for 10 minutes. Add black olives, mascarpone, and basil. Stir to incorporate. Meanwhile, cook rigatoni pasta according to instructions on package. Drain pasta and add to sauce mixture. 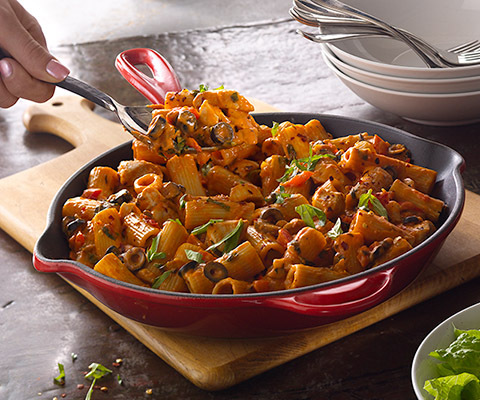 Serve promptly and add red pepper flakes to taste. I would add tablesppon of brown sugar to this recipe to cut down on the acidity of the tomatos in the sauce. Ya know what this is missing? Original recipe is from Upstate NY (Utica NY). Recipe is great and even tastes better as leftovers. We add about a half cup of white wine or vodka to the sauce.